The Bombay High Court (HC) dropped the murder charge against a man sentenced to life imprisonment for killing his minor daughter, 18 years ago. The HC decided that the man be released after observing that he had assaulted the girl in a fit of rage and had already served over 14 years in jail. The Bombay High Court has set aside an order of Maharashtra government’s Caste Scrutiny Committee which had invalidated the claim of a student that he belonged to the Scheduled Tribe. The court said the committee had not considered Swapnil Gaikwad’s documents and evidence. 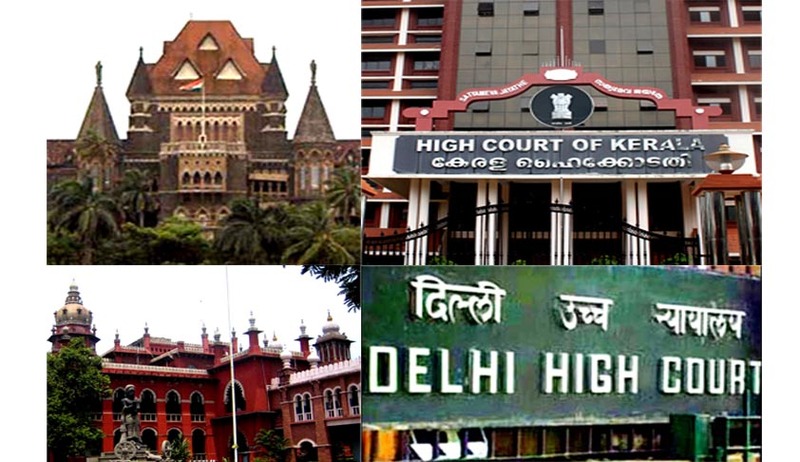 The Delhi High Court has slapped a cost of Rs 2 lakh on the city government for its failure to create mass awareness against sexual offences concerning women and children. It also rapped the Centre and the Delhi government for their lax approach in abiding with court orders and focusing more on promoting individual ministers rather than on making the public aware of the new laws. Delhi High Court Seeks IAF reply over Officer’s marriage with Missing Man’s wife. In a case involving a Squadron Leader in the Indian Air Force, Delhi High Court reportedly demanded an answer from the IAF on a petition which alleged that it wasn’t co-operating in an investigation into the marriage of the petitioner’s daughter-in-law, Smt. Latesh Jain, to the Officer in question, by declaring herself a widow. A Division Bench of the Kerala High Court comprising of Justice Antony Dominic and Justice Alexander Thomas recused from hearing appeals related to renewal of bar licences in Kerala. The Bench recused from hearing the matter without citing any specific reason. The Kerala High Court on Friday observed that a new and devotee friendly security cover should be put in place at the Guruvayoor Sree Krishna Temple to control devotees. The High Court of Karnataka on Thursday declared as “unconstitutional and invalid” the University Grants Commission (Institutions Deemed to be Universities) Regulation 2010 pertaining to governance system, admission and fee structure and opening of campuses of deemed-to-be universities in the country.